The preamp and line amp circuitry found in the B173 500 is identical to the original B173. Not a single component or design feature was compromised while converting it to a smaller package. As a result, the circuit boards are jam packed with all sorts of delicious components, including a brawny Cinemag input transformer! The power supply is the backbone of any preamp design, and can make a huge impact on the overall sound and performance of the preamp. The +24V rail needed to power the B173 500 is painstakingly converted from the +/- 16V rails of a 500 series rack using a custom DC-DC converter circuit specially designed to keep any unwanted noise or modulations out of the signal path. Complete isolation is then achieved through the use of inductors, ferrite beads, decoupling capacitors, power regulation, and a custom enclosure surrounding the entire circuit. The B173 500’s “Class A”, discrete circuitry combined with high-end components provide a fresh approach to a classic sound that won’t disappoint! The B12A MKII 500 packs the same punch as its 1⁄2 rack cousin, but in the convenient and flexible 500 series format. 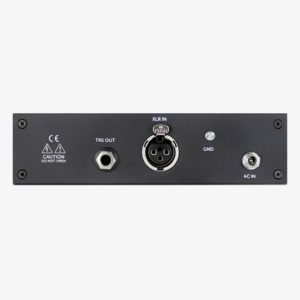 The API®-style design features a delicious Cinemag input transformer, serves up huge portions of low-noise gain, and has the same classic American rock sound that the original API® 312A is known for! Get ready to fill your lunchbox®, ‘cause once you go Black Lion Audio, you never go back!